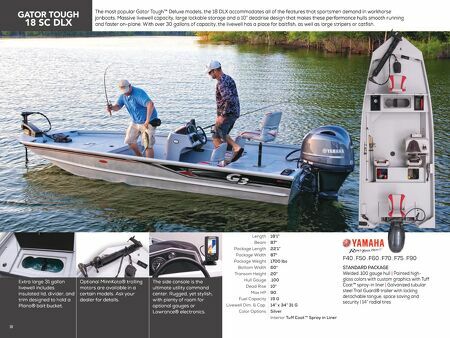 The most popular Gator Tough™ Deluxe models, the 18 DLX accommodates all of the features that sportsmen demand in workhorse jonboats. Massive livewell capacity, large lockable storage and a 10° deadrise design that makes these performance hulls smooth running and faster on-plane. With over 30 gallons of capacity, the livewell has a place for baitfish, as well as large stripers or catfish. STANDARD PACKAGE Welded .100 gauge hull | Painted high- gloss colors with custom graphics with Tuff Coat™ spray-in liner | Galvanized tubular steel Trail Guard® trailer with locking detachable tongue, space saving and security | 14" radial tires Extra large 31 gallon livewell includes insulated lid, divider, and trim designed to hold a Plano® bait bucket. F40 . F50 . F60 . F70 . F75 . 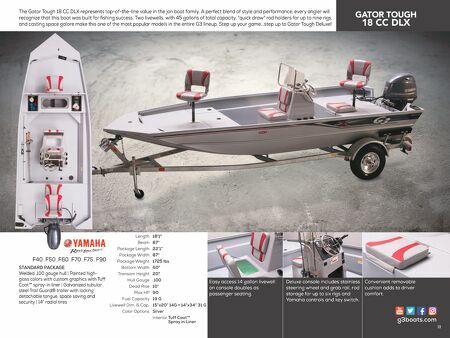 F90 18'1" 87" 22'1" 87" 1700 lbs 60" 20" .100 10° 90 19 G 14" x 34" 31 G Silver Interior Tuff Coat™ Spray in Liner Length Beam Package Length Package Width Package Weight Bottom Width Transom Height Hull Gauge Dead Rise Max HP Fuel Capacity Livewell Dim. & Cap. Color Options 58 The side console is the ultimate utility command center. Rugged, yet stylish, with plenty of room for optional gauges or Lowrance® electronics. Optional MinnKota® trolling motors are available in a certain models. Ask your dealer for details.